Wow. I think this is officially the longest I've gone without posting. I'd like to say things are going to change now, but that's just not true. My new(ish) job, the kids' schedules, and the insanity of life in general are eating up even the tiny bits of time I once had to devote to this blog once or twice a week. And I also must confess that I've found microblogging a lot easier and more time-efficient. I can share a news story or an opinion on Facebook and quickly and easily talk about it with friends. I still want to continue this blog (which will celebrate its 6th birthday in July), but until I have a more regular schedule (ha), updates won't be frequent. Now, on to the Dynamic Duo, who turned 2.5 two weeks ago. We have officially entered the Land of Why. "Nicholas, get your coat on." "Because we need to take Isabella to preschool." "Because if we don't leave right now, she's going to be late." "Why? I don't want to go!" Both Luci and Nicholas love asking "why?" as a response to just about everything I ask them to do now. It's cute for awhile. After all, I'm a big "why" girl. I need to know why, so it makes sense that as my children, they do too. But it's "why?" times two, which means I am constantly (and I mean, constantly), talking to them. Every dream Nicholas had came true a few weeks ago when we bought the boy a pair of red shoes. And of course, true to form, he is obsessed with them, and pitches epic fits when we try to get him to wear the more traditional pair of shoes we also got him, for those less-than-red-worthy occasions. Nicholas creates elaborate bedtime story plots for me to tell him while I'm rocking him. 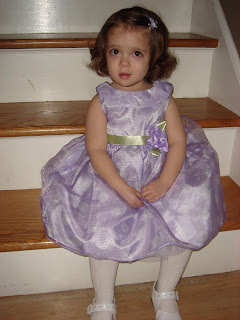 Isabella also started to do this when she was about 2.5. His story de jour revolves around our neighbor, "Miss Kim," who takes Nicholas for a bike ride, then inside her house for a snack. He also asks for a story about a baby crab who is lost on the beach and looking for his mommy. This one's got a vivid imagination. He is still not napping well (he averages maybe two a week). I put him in his crib at naptime each day, though. He spends most of it yelling, "I'm tired!!!!!" He absolutely loves to tell anyone and everyone who will listen about the grave injustices his twin sister imparts on him and others. "Luci bit me on my arm, and pulled my hair." Are you noticing a theme here? This one (who looks like the living embodiment of sunshine and sweetness) has tiny little horns tucked under her mass of curls. She is a button-pusher, or what my family likes to call "a scorch" (definition here). Luci is not only fearless (she has begun to scale her highchair like a rock wall and plop herself into her seat with zero assistance from me), but she is stubborn, obstinate, and enjoys giving all authority figures in her life a symbolic "F-you." I see skull tattoo and obscure piercings, prison, or a CEO position in her future. She is also the most physically aggressive of the three kids, which is something we're working on curbing. Her bond with Isabella continues to tighten. She tells Isabella almost every day as she leaves for preschool, "I'm gonna miss you." The bottom lip comes out. There are tearful hugs. It is quite cute. Potty training was attempted for approximately one day back in the beginning of the month. The hubs, who for the most part managed Isabella's transition to underwear, tried with Luci and Nicholas, but quit the next day. They will both go if you place them on the toilet. Sometimes, Nicholas will tell you he has to go, and will do so. But for the most part, neither tells us in advance that he or she has to use the facilities. The hubs declared them "not ready" and so we've kept the potty out and available, but it's not being used on a regular basis. They must be trained by September, once preschool begins. Other than that, I'm not in too much of a hurry. While these two are still high-needs, scream a lot, and fight like the Sharks and the Jets, times, they are a'changing. The number of moments during the day when I want to throw myself off a bridge because I can't take one more minute of their constant whining and crying are fewer. Whether that's a change within myself or as a result of their changing behavior, I haven't yet determined. The older child, twin toddler mix is interesting. 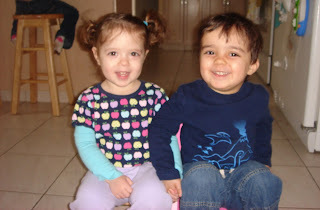 When Isabella is taken out of the picture (when she's at school or elsewhere), Luci and Nicholas are better behaved. When she's around, she tends to instigate them (and they, her), and sometimes all three argue over the most insignificant events. That said, she also occupies them, directs them in some very fun games, and helps them get dressed, etc. And they absolutely idolize her too. Current Likes: Her dinosaur stuffed animal, whom she named "Monster,"
IVF and girl/boy twins born in October 2008 following FET. Come along as I document the search for my lost intellect. It's a bumpy ride. Consider yourself warned.